As you travel through South Dakota, there are some places you simply cannot miss: Mount Rushmore National Memorial, the Crazy Horse Memorial, the Black Hills National Forest, Custer State Park, and the historic town of Hot Springs. Wherever you go, you will find a cozy resort, inn, or lodge offering a warm welcome, comfortable bed, and a good meal. Located near Chamberlain on the banks of the Missouri River, the 1995 Arrowwood Cedar Shore Resort offers fantastic views of the water and the surrounding nature. Guests can choose rooms in the main lodge building, in private cottages, or in the campgrounds. All guests enjoy access to the resort facilities, such as an on-site marina, free Wi-Fi, indoor pool, hot tub, sauna, games room, exercise room, cable TV, and iPod docking station. The resort has two restaurants: Bridges Restaurant & Lounge, which serves classic American fare, and Waterfront Grill & Tiki Bar, which is open in full season and offers wonderful waterfront views and live entertainment on weekends. The resort is very popular with fishermen and hunters because of its proximity to the Chamberlain Recreation Area. 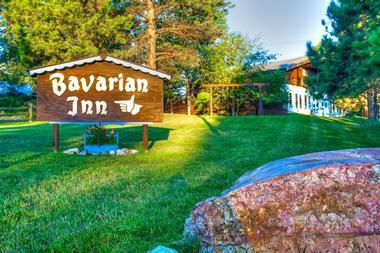 Surrounded by lush evergreen forest, Bavarian Inn is a cozy chalet-style hotel about 14 miles from the Jewel Cave National Monument, less than 20 miles from Mount Rushmore National Memorial, and a short drive from the Crazy Horse Memorial. The rooms are comfortable and modern and have free Wi-Fi, mini-fridges, microwaves, flat-screen TVs, and luxury linen. Some rooms also have whirlpool tubs, while suites add pull-out sofas. Guests enjoy complimentary continental breakfast, afternoon cookies with milk, heated indoor and outdoor pools, a tennis court, two playgrounds, and a hot tub. There are also laundry facilities and a grill with stone fireplaces. Pets are welcome. Canyon Lake Resort is a family-owned lodging on the shores of Canyon Lake, not far from Rapid City, about 4 miles from the Black Hills National Forest and 23 miles from Mount Rushmore National Memorial. The resort has 11 modern motel rooms, six private two-bedroom cabins, three smaller cabins, one family-style three-bedroom cabin, a five-bedroom house, and a lodge with nine bedrooms. The rooms in the main building have external entrances, Wi-Fi, and cable TVs. The cabins have Wi-Fi access, cable TV, and fully equipped kitchenettes. Larger cabins have full kitchens and living rooms. Guests enjoy free use of paddleboats, a BBQ area with picnic tables and a firepit, and a seasonal outdoor pool. Located in Custer State Park in the scenic Black Hills of South Dakota, less than 15 minutes from Mount Rushmore, the Crazy Horse Memorial, and Custer State Park, Creekside Lodge is a charming hotel built in 2008 and located on the grounds of the historic State Game Lodge. The lodge is open year round and offers a range of activities in all seasons. It has 30 luxurious, modern, spacious rooms with a rustic decor and pillowtop beds and duvets. The lobby is a popular gathering area, with cozy fireside seating and a great room. The lodge is surrounded by green hills where guests can spot roaming buffalo, wild turkeys, deer, and bighorn sheep. There is a modern meeting room with a built-in sound system that can accommodate up to 75 people. Deadwood Gulch Gaming Resort is located in the Black Hills National Forest, about an hour from Mount Rushmore National Memorial and a short drive from downtown Deadwood. The resort has a 24-hour casino that includes blackjack and slots. 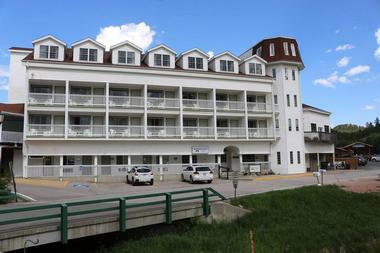 The 87 resort rooms are modern and comfortable, with free Wi-Fi, soft colors, flat-screen TVs, and coffeemakers. If requested, microwaves and mini-fridges are available as well. The resort’s Creekside Restaurant offers home-style cuisine and serves breakfast, lunch, and dinner and has a waterside terrace. The fireside bar offers late-night pizzas, and there is a bakery in the lobby. It also has a hot tub and fitness center. Parking is free. Located high up in the Black Hills in the Norbeck Wildlife Preserve, the K Bar S Lodge is an Ascend Hotel Collection Member. This modern lodge in Keystone, South Dakota, is surrounded by scenic hiking trails and is only about 3 miles away from Mount Rushmore. It is also close to attractions such as the President’s Alpine Slide, Rushmore Cave, and Custer State Park. 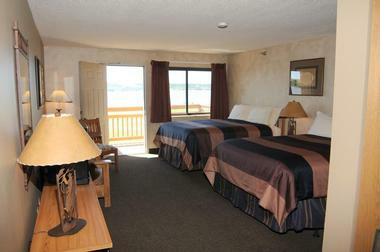 The rooms are relaxed and warm and feature free Wi-Fi, flat-screen TVs, MP3 docks, fridges, and coffeemakers. Some rooms also have hot tubs and private decks. Many rooms have fantastic views of Mount Rushmore. The guests enjoy complimentary continental breakfast served in a glass gazebo, a lobby with a stone fireplace, and a spacious outdoor terrace with a firepit. Legion Lake Lodge is located on the banks of Legion Lake within Custer State Park, about 4 miles from Mount Coolidge and Custer’s Black Hills Playhouse. 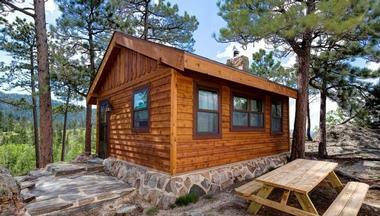 The lodge has 26 laidback cabins with free Wi-Fi, flat-screen TVs, microwaves, mini-fridges, and coffeemakers. Some cabins also have decks, kitchenettes, and/or living rooms with sleeper sofas. 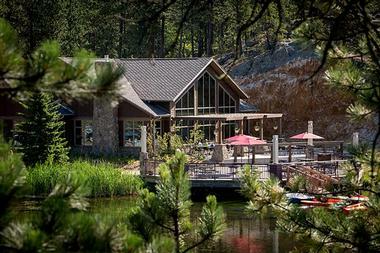 The lodge is surrounded by lush forest and is close to the famous Centennial Trail. There is a seasonal restaurant with wonderful outdoor terrace by the lake, a small beach with boat rentals, and a playground. Parking is free. There is also a small store where guests can buy a fishing license and supplies. 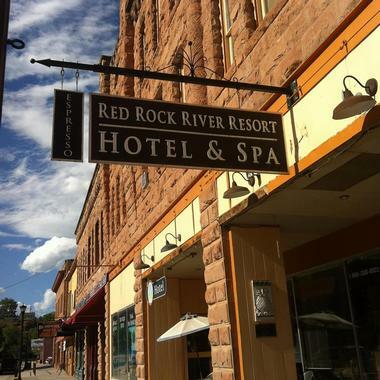 Located in the four-story renovated 1891 sandstone Minnekahta Block in historic downtown Hot Springs, Red Rock River Resort is a luxury resort with nine beautifully and uniquely decorated rooms. 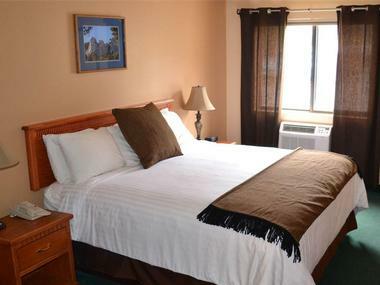 All rooms have free internet, ceiling fans, cable TV, high ceilings, deep windowsills, luxury linen, and down pillows. Guests enjoy a full-service spa, a bar and lounge, massage rooms, concierge services, and free parking. The resort is only about a mile away from the Mammoth Site of Hot Springs, 9 miles from Black Hills National Forest and Wind Cave National Park, and 11 miles from the J. H. Keith Cascade Falls Picnic Area. Located within a national park and a short distance from the Black Hills National Forest, the National Presidential Wax Museum, and Rushmore Tramway Adventures, Rushmore Express Inn is a family hotel about 2 miles from Mount Rushmore. The charming rustic decor combines with modern amenities such as cable TV, free Wi-Fi, pillowtop mattresses, microwaves, coffeemakers, and fridges. Suites also have fireplaces, sofas, and luxury bathrooms with granite floors. Some rooms have bunk beds and whirlpool baths. 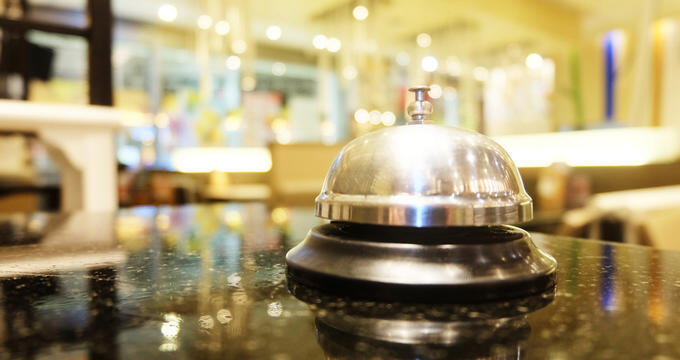 Guests enjoy complimentary continental breakfast, free parking, an exercise room, a Jacuzzi, a heated indoor pool, and a 24-hour business center. Located in Custer State Park off the Wildlife Loop Road, State Game Lodge is a stately stone and wood lodge built in 1920 in a large mountain valley, surrounded by old oaks, birches, ponderosa pines, and aspen trees. 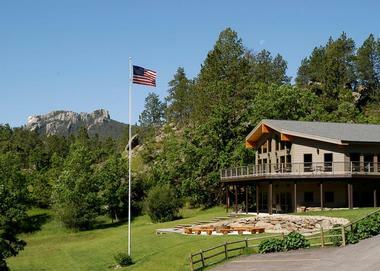 It is the largest lodge in Custer State Park and is listed on the National Register of Historic Places. The lodge served in 1927 as the Summer White House for President Calvin Coolidge and was visited in 1953 by President Dwight D. Eisenhower. The guests can choose between 104 rooms and cabins. All cabins have climate control, are fully furnished, and include daily housekeeping. All units have flat-screen TVs, fridges, and coffee pots. Some cabins have full kitchens and some are outsized; one can even fit 28 people. All cabins feature picnic tables and outdoor firepits. Pets are allowed in some cabins for an additional fee. Sylvan Lake Lodge is an upscale stone and wood lodge with cabins on the banks of Sylvan Lake, within Custer State Park and about 12.4 miles from the Crazy Horse Memorial. The rooms are cozy and modern and can accommodate up to four people. All have coffeemakers and flat-screen TVs. Cabins, which can fit up to ten people, feature microwaves, mini-fridges, fireplaces, outdoor picnic tables, and firepits. Guests enjoy an upscale seasonal restaurant that serves locally sourced produce and meats and has a beautiful terrace overlooking the lake. The rugged landscape around the lodge is a beautiful backdrop to the stately lodge and is full of scenic trails. Located in the Black Hills of South Dakota, The Lodge at Deadwood is an upscale hotel and casino about 2 miles from historic downtown Deadwood. The on-site casino has 270 slot machines and an indoor waterpark. Rooms are modern and nicely decorated in soft brown colors and have all modern conveniences such as free Wi-Fi, flat-screen TVs, iPod docking stations, desks, and coffeemakers. Some rooms have balconies, while some suites have fridges, microwaves, and fireplaces. Guests enjoy free parking, a 24/7 gym, and an indoor pool with geysers, waterslides, and a pirate ship. A casino has slot machines, poker, and table games. The lodge has a spa, the Deadwood Grille, Oggie’s Sports Bar & Emporium, four meeting rooms, and a ballroom that can fit up to 1,700 people. The Roosevelt Inn is a small, family-run and owned hotel located in downtown Keystone, 2.2 miles from Mount Rushmore and 1.1 miles from the Keystone Museum. The rooms are understated and comfortable, featuring free Wi-Fi, coffeemakers, cable TVs, private baths, heating and air conditioning, direct-dial phones, hairdryers, queen or king-sized beds, refrigerators, and DVD players. Some suites have whirlpool tubs, sofas, and/or balconies. 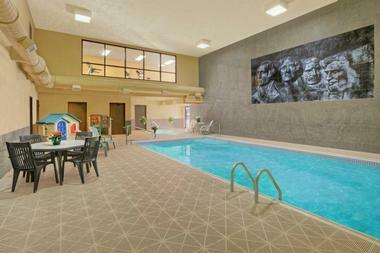 Guests enjoy a complimentary continental breakfast, a seasonal hot tub, a pool, an indoor/outdoor sundeck, a game room with a pool table and 53-inch TV, and a coin laundry. Parking is free and children under the age of 15 stay for free.